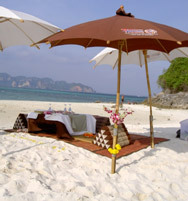 "Land Nature visiting, 4 Islands snorkeling, one night on Aow-Nang beach by Private Service." They are beautiful 3 Provinces in the southern of Thailand. Krabi is the most popular destination of the tourist from around the world same as Phuket. 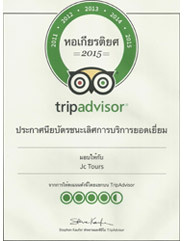 Nowadays, Jc.Tour (Phuket) makes the dream of all around the world tourist-especially who is getting holiday at Phuket or Kho Lak Beach - come true. 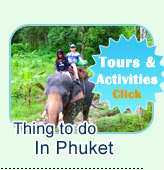 All tourist can book the special Private Package for 2 Days 1 Night in Krabi with Jc.Tour (Phuket). 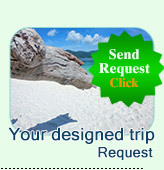 The Package will leave from Phuket or Kholak Beach. 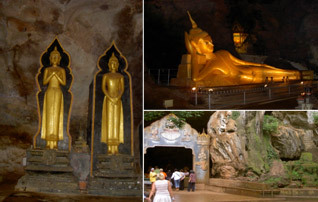 There is the old holy reclining Buddha inside and there is several historic action of the Buddha in the deep cave. In the deepest of the Cave, there is very valued Buddha and limes stone show the age of the cave. Outer of the cave, it still be the thick mountain forest with full of the monkeys-they come to ask some food from the tourist. The temple is on the mountain. The Pagoda is called if with out the bone of the lord Buddha (Buddha Atthi) But if the Lord Buddha's bone is inside the Pagoda, we call Prathath. The people who come to Krabi, they should visit this temple. If not, it means never reached Krabi. In this temple, you can sea the difference action of the Loard Buddha and the high light at 1, 500 steps stair up to see the Krabi view. In the safari of the national park in Krabi. The nature creates some wonderful thing, Crystal Lake-water come to the lake from some where. It makes very clear crystal water amid the forest. You can see the fish under the water just by your naked eyes.